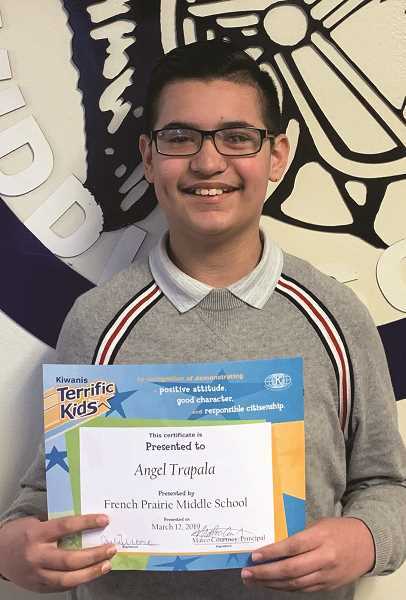 The son of Edmundo Trapala and Mirna Camarena, Angel is a sixth-grader at French Prairie Middle School. He has one sibling — Duilio Trapala. Angel's favorite class is math because he is good with numbers and likes studying algebra. His future goals are to continue to do his best, get straight As, follow directions and not misbehave. After graduating high school, Angel wants to be a doctor — which is why he wants to continue studying math, science and health. His teacher, Gergana Dezsofi said: "Angel is an exemplary model of our French Prairie values of respect, hard work, teamwork and responsibility. Angel is always on time and prepared to learn. He works well with others, and it is truly a pleasure to have him in my language arts class. Seventh-grader Andrew Perfecto is the son of Alma Delia Tapia and has five siblings — David, Deliani, Angel, Jordan and Amaris. His favorite activities and subjects at school are band and math. After high school graduation, Andrew wants to study to become a lawyer. 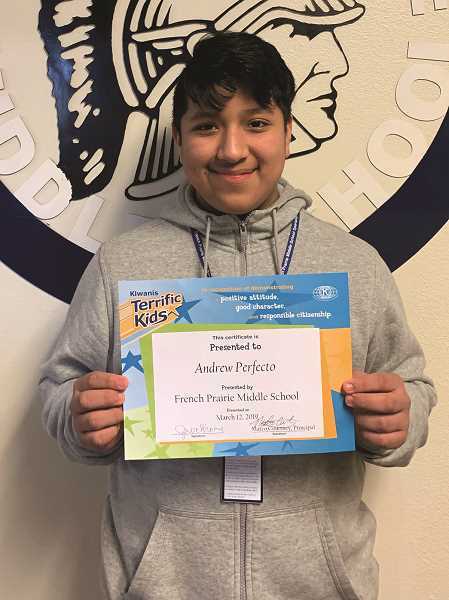 His teacher says: "Andrew works very hard in all of his classes and always does it with a smile on his face. His positive spirit makes him a good friend to many. He is very thorough and makes sure to ask questions when he isn't sure of an answer. Besides being a great student, Andrew also participates in the advanced band, where he plays the trumpet." 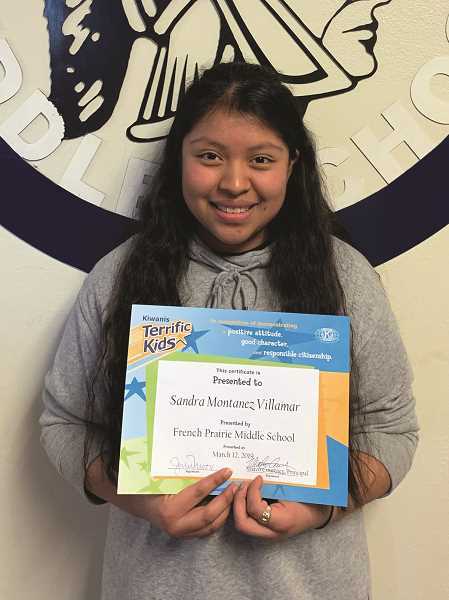 Sandra Montanez Villamar is the eighth-grade daughter of Eloy Montanez and Araceli Villamar Ramirez and has one brother, Luis. Sandra enjoys all her classes, especially language arts and art. She has a creative mind and loves to read, write and draw. At school, Sandra loves to help with activities through her WEB Leaders program. She also loves to attend school dances so she can have fun and spend time with friends. After graduating from high school, Sandra plans on attending college and hopes to be an author or creative writer. She enjoys books because they are a window to the world. Her dream is to travel across Europe some day and visit the United Kingdom, France and Spain. Her teacher says: "Sandra is friendly, supportive, helpful and well-liked by her peers. She is a hard-working student who strives to be the best she can be. Sandra puts time and effort into everything she does, which will help her to achieve her goals. With her creativity and dedication, I have no doubt she will fulfill her dreams."